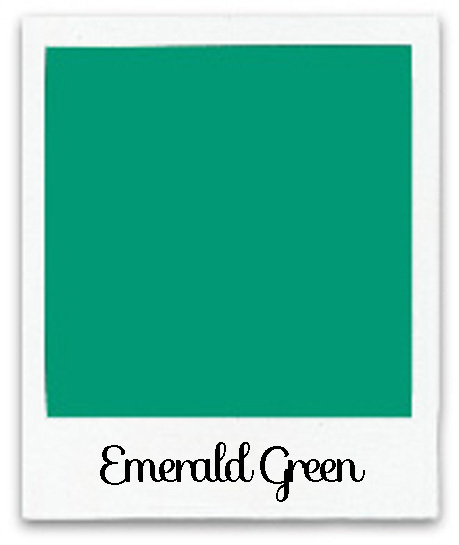 If you haven’t heard yet, Pantone has picked Emerald Green as the 2013 Color of the Year. I think it’s a gorgeous color, although I wasn’t sure how likely I would be to actually use it in my home, other than during St Patrick’s Day or Christmas, that is. In fact when I first heard that it was the pick of the year, all I could think of was “The Emerald City” in The Wizard of Oz… though not in a bad way! However I did some poking around and I’m warming up to it a whole lot more now… more on that later though. Sherwin Williams has some color picks for 2013 as well. I found this Aloe Green color in their Vintage Moxie collection. I think I would be more likely to use this one on the walls of our home… just a personal preference, I have seen Emerald done on walls and it can be really beautiful. After window shopping online a bit, I found some beautiful Home Accessories in both shades, that really made me excited about the possibilities of either color. I found a number of gorgeous pieces from Wayfair like …. 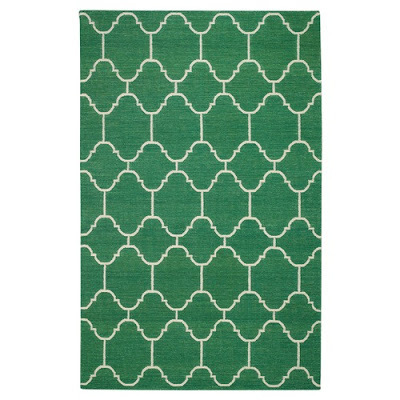 this Serpentine Emerald Rug from Genevieve Gorder Rugs. This would be fabulous in a living room or dining room! 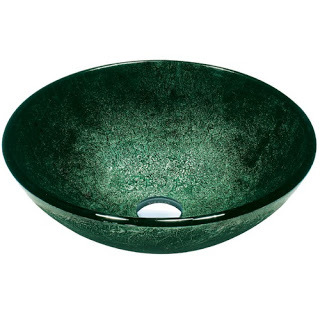 This Vigo Emerald and Black Tempered Glass Sink Bowl. It’s like a piece of art for your bathroom! This fantastic, although high end, Emerald Matrix Lamp, from Babette Holland. I think the texture and sheen is so elegant. 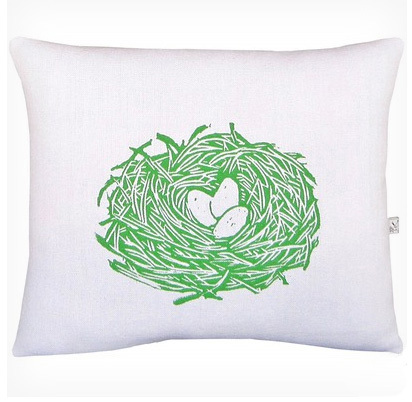 And this adorable Artgoodies Nest Block Print Pillow. Love that green nest! 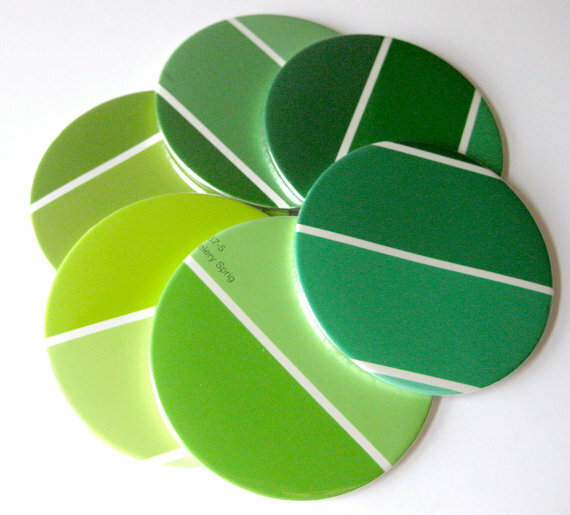 A little visit to Etsy turned up these super cute Paint Chip Coasters by Meow Kapow Shop! 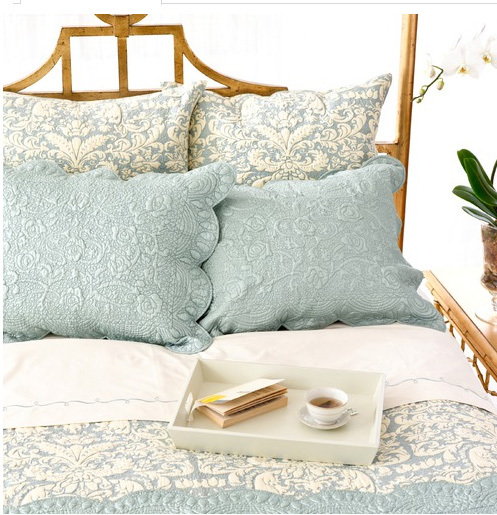 This dreamy Grace Damask Bedding from PineCone Hill, also found at Wayfair. So pretty! 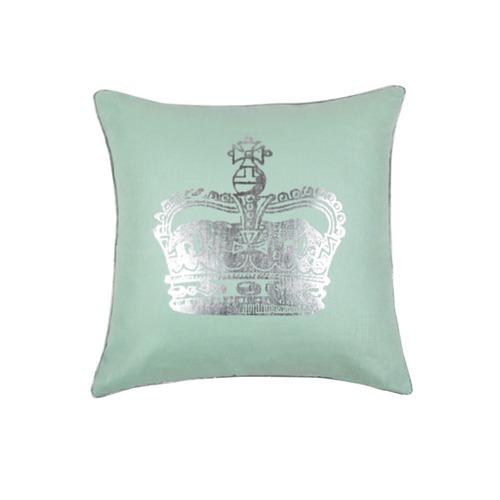 This Regal looking Pillow from BlissLiving. I do love a pretty Crown! At Macy’s I found the cutest KitchenAid Mixer in the world, in Pistachio!! This one makes me swoon! 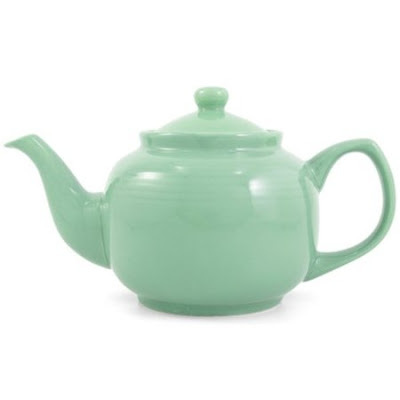 On Amazon I found this charming Ceramic Teapot! Such a great classic shape!! 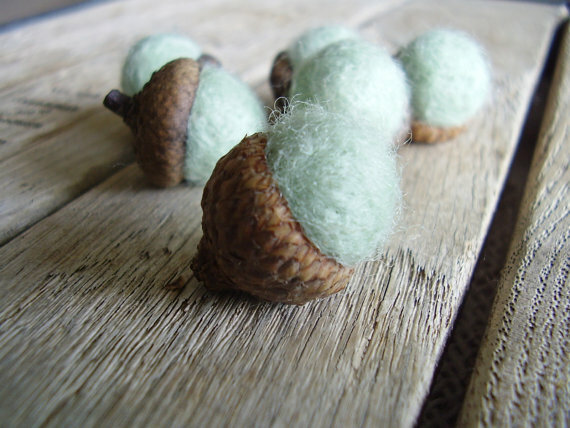 And speaking of charming, what could be cuter then, these Felted Wool Acorns found, on Etsy, at House of Moss! I’m coming down on the ‘Aloe’ side Karen, the Emerald is beautiful but a little too vibrant for my tastes although that rug is gorgeous! And I’m with you on the KitchenAid mixer in pistachio, LOVE! Thanks for the colour update, I was wondering what it was this year. Thanks for your opinion Deb! I think for those of us that have a love for Vintage and time worn things, the aloe fits a little better with our style! 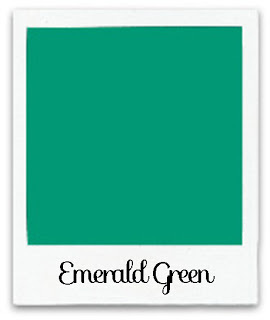 I’m not in love with the Emerald….sorry Pantone! 😉 But I’m loving the Aloe Green, and the bedding and the mixer. Oh my. Gorgeous shade. I’m glad you like the Aloe Green Nancy! That mixer is the best … right?!! I don’t even cook that much, but I want it! I’ve wanted that mixer for a while just for the color! I barely cook too! My vote is for the aloe as well. It is so soothing! Hi Kristi, Thanks for the heads up about the word verification, I have no idea how that got turned on! It’s off now, hopefully it will stay that way! It looks like that’s 3 votes for Aloe! OOOOOOH I LOVE the Aloe, it has such a vintage vibe! 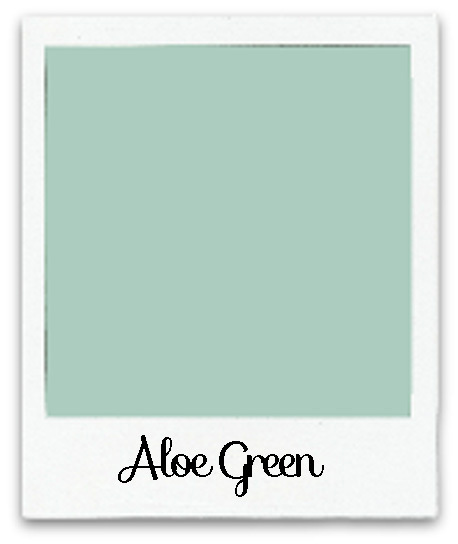 I’m torn….Emerald green as the new color or with my heart in the Vintage Vibe Aloe!?! Oh, our first tie! Thanks for weighing in Jenny! That was my thought about the Emerald too, it is a glam look, especially in some of those accent pieces. Really striking! Aloe is too close to mint for my taste. I would use the emerald as an accent colour. Maybe. Thanks for your comment Maureen! It is a minty sort of a color. Oh I love the Aloe as well for the vintage feel. I have been wishing I had a whole other kitchen that I could do in a fifties look! We were in a small antique mall getting an item when I saw a retro table, and wished I had the room for it! Lately I have been creating a number of t-shirt designs in my ‘Queen’s Table zazzle shop’ with the emerald green color. That’s because of my green smoothie and green juicing theme. So the deeper green works in that situation. I also have found that I tend to really like the aloe or celery colors for the t-shirt material of some of my black ink designs. I have a bottle of acrylic craft paint in the pale green color called Sea Glass. It’s gorgeous and going into some of my paintings. Thanks for the post. Green is such a great color. Thank you for your comment Melissa! 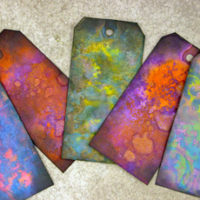 I love sea glass, what a great name for a paint color! Mine too Jen! I just think it’s the most amazing thing! I love the Aloe green, so fresh. I love the mixer, even though I already have one, I love the bed linens and I love the teapot. I will have to get one of those definitely. I find green a tricky colour I either love it or hate. Emerald is beautiful if it is a stone set in a ring for me. Thanks for commenting Kim! Greens can be funny, I typically don’t care for the ones with a lot of yellow in them, but there are a lot of greens that I do like! I have to vote in also the Aloe…although I don’t think I would paint a wall, but LOVE the bed linens! 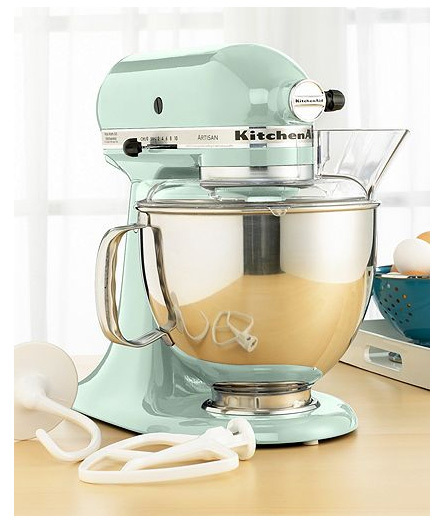 I love to bake, but am a TERRIBLE cook (but I TRY)so the mixer would be purely for looks…and looks it has, I WANT!!! Thank you Pendra! I do feel like I might be inspired to cook if I had that mixer!! Glad you liked it too! I love both colors but I would definitely use them differently. 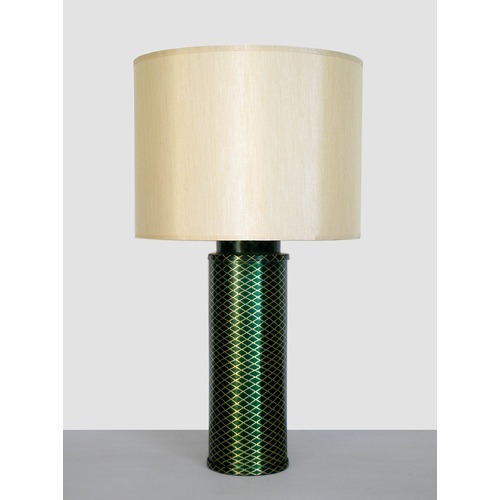 Emerald Green is a highly saturated/high intensity color. As such, I would use it sparingly as a home accent color in a print or perhaps in curtains or a small painted piece of furniture. If you can wear Emerald Green as a color, go for it. Aloe Green, being a lighter in saturation and hue, can be used in great big swathes all over the place in the home or as a clothing neutral. I would love to see this in a bathroom, for instance, or as shown above, in bedding. So soothing! Well said Taimdala!! I totally agree! The mixer and the bedding have my vote! I’m glad you liked them Sharon! For me the Aloe wins because it is the pretty softness of the sky in the morning just before the sun breaks over the sea, it is the promise of spring in the robins egg, it is welcome of winter in the spruce ,it is the tranquil calm of the heavens glimpsed through through the branches of a shady tree…it is the soft,romantic hue of times past and it is both serene and welcoming.Aloe invites you . Strangely although Emerald can be beautiful in endless fields of green or in the forest it can also be dark and dangerous like the jungle but when used in the home can even be imperious ,royal and demanding . Emerald as a color in the home is commanding and queenly and expects admiration and a certain formality………which bring me back to Aloe.Aloe says home and Emerald says Palace ! Amazing! You are amazing!!! This is so beautiful Cassandra, that I printed it out to show my husband! You really must start a blog, so that you can share your talents with the world! Also, I hope you will go back and see all the comments, in response to the comment that you left a few days ago. You already have several fans! I’m smiling with happiness. Nobody has ever called me amazing before.How kind of you to let me know that you printed out my comment to show your husband. I think the most special thing about you is that you don’t just think things and keep your thoughts inside your head ,you let them go out into the world winging their way into others hearts.You bring joy. Let us know if you start one Cassandra, you already have people here that would read it!! Love the damask bedding, but I wouldn’t let anyone near it with something that could spill. Too pretty. Love the pistachio mixer; much better than the red you always see. Darling acorns. In general, love the softer greens. The fact that some group picked a “color of the year” doesn’t really mean anything to me. The items you displayed here do intrigue me, though. Thanks. Thanks for your comment! It does seem silly that last year orange was in and now this year emerald is in, I think it does make you think about how you would use different colors, but in the end we have to go with what we like! Love the Aloe and Silver together, industrial meets calm…nice. I agree Cheryl, it’s a lovely combo! I love them both… emerald and I are old companions, and aloe is a new friend. Aloe is the glorious sky surrounding cherubs in a DaVinci, the glassy lapping of the sea on a clear day… a spring color, perhaps. Emerald beckons one to come and breathe deeply, ponder and sleep. Aloe calls out with lightness and joy, gently exciting us to trust and to hope. Lovely words Laura!! How nice that we have 2 talented poets here to describe these colors so beautifully!! After painting my kitchen mustard yellow and using my blue,red & green accents I have fallen in love with aqua, aloe, pistachio shades. I’m using those colors with pink in my bedroom instead. One of these years I’ll get it done the way I want. Oh, I think it would be pretty with pink! The red pieces in your kitchen sound so fun too! Ooooh, that mixer gave me chills! It is such a beautiful color. I do love them both…green being my favorite color but I’d have to side with you on keeping the walls a soft light color. I’ve gone bold and dark and found that I just can’t take it for long. 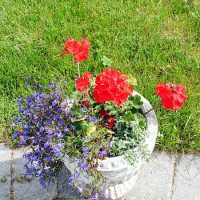 Great post…loving all of the items you found. Wayfair has some great stuff! Thanks Sherry! Yes, I was surprised at the volume of merchandise that Wayfair carries, you can find pretty much everything there! I’m not a fan of most greens, but the aloe green shade is very pretty when combined with cream, gold, and aqua in many of the beach or sky scenes that are depicted in vintage images. Thanks Pat! 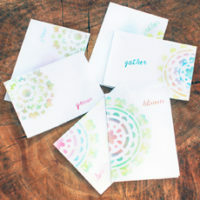 Yes, I agree that it would be lovely with all of those colors. Great information here! Like stems on flowers Green goes with just about everything! So true Walter! I’m glad you liked this post, thanks for your comment! I used to own an 1878 Adobe Farmhouse in San Diego. The previous owner had painted the kitchen in this emerald color. I NEVER would have picked it in a million years, but grew to love it. We had shaker white cabinets, dark grey, black and green granite, butcher block counters as well, and wood floors, all with a cute sloped ceiling. All I can say is it was charming, fresh and cheerful. So much so, that I repainted the walls the same color when it needed to be freshened up. Thanks Audrey! I wish I could see pictures of it, that kitchen sounds amazing!! Although green can be very pretty, some of it reminds me of the 80’s/90’s with dark green marble everything. There’s only some things you want to do once Ha! I’m not a fan of that dark green marble either!